LG may be unwilling to admit the existence of its latest slider, set to be called Glimmer, but pictures of an advertising flyer photos have already slipped out in the US. LG's Glimmer: only looks set to appear in the US? The handset looks a little like Samsung’s G600 - reviewed here - and has a 2.8in touchscreen housed within a metal body. 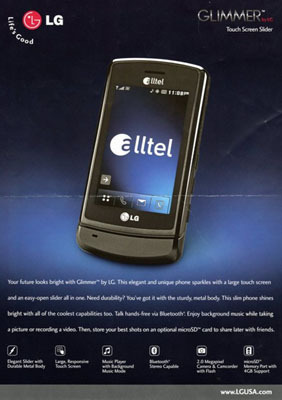 According to the flyer - posted by Photobucket contributor ThatPhonePerson - Glimmer runs on the 1.9GHz and 800MHz CDMA frequencies and supports EvDO, a 3G rival to UMTS. LG also mentions that Glimmer can display streamed YouTube content. A haptic “touch key vibration” is present, which features on Samsung’s updated U600, and a two-megapixel camera is included too - it can record video at a resolution of up to 320 x 240. There’s a 128MB memory built into the phone, but an external memory card slot supports Micro SD cards of up to 4GB, which are sold separately. Bluetooth 1.2 with A2DP stereo streaming, and a USB 2.0 port are also present to give users alternate ways of transferring data on and off of the phone. No self-respecting handset would be without any music capabilities these days, so the Glimmer supports MP3, WMA and AAC formats. LG’s flyer also refers to a talk time of just over three hours and a seven day standby life. Pictures show the handset with the logo of US telco Alltel. An LG spokeswomen told us that the company has no plans to bring the handset into the UK, though she stressed that her statement shouldn't be taken as confirmation of the handset’s existence. So, there’s no glimmer of hope for British buyers then?